As a mild winter turns into an unusually nice spring here in Beaverton (last week we had multiple days with clear skies and highs in the upper 70s °F), a young ham’s thoughts turn to portable activations, Field Day, SOTA, and the like. I’ve been looking forward to this summer for the opportunity to take the CC1 out in the field, but I may not get to be quite as adventurous as I hoped. Last winter, I slipped in a wet patch on the concrete in the garage and hurt my knee. As a typical guy, I didn’t go to the doctor to have it checked out, I decided to “walk it off”. It did heal, but not completely. So I finally gave in and saw my doctor about it a few weeks ago. She strongly suspects a torn meniscus, and ordered an MRI to confirm it. Unsurprisingly, my insurance company denied coverage on the MRI, instead expecting me to do a bunch of physical therapy based on at best a guess on what the problem is. Coming from a technical background such as mine, this boggles my mind. When you have a problem and you have the tools to make a measurement, you make the measurement to see what’s wrong, not just take a course of action based on a guess! I understand that money is the driving factor behind this decision, but it still seems like a waste of resources for both myself and the insurance company. Not to mention that I don’t have the faith in the efficacy of physical therapy that consensus medicine does. So now I have to decide whether to shell out beaucoup bucks on physical therapy that probably won’t do anything other than siphon money from our family to their coffers. I’ve looked at many recommended loan options in the meantime and if that fails to miraculously heal the non-specific “knee pain” referred to by the insurance company, then I guess I get the privilege of paying for the MRI that I should have had in the first place. I’m completely fed up with politics, so I have no desire for a political battle in my comments. I’m quite aware of the history of employer-provided health insurance in the US, and the effect of government distortions in the medical marketplace. There’s plenty of blame to be handed out all around, so let’s just leave it at that. Anyway, I may not get to do any SOTA summits this year (except for perhaps a super-easy one such as Cooper Mountain right on the outskirts of Beaverton), but hopefully I can at least get out with the CC1 for portable ops to the park or while camping. Speaking of the CC1, it’s at a bit of a lull in its development right now. I’m waiting for all of the beta builders to complete their construction so I can be sure that I have all of the major hardware bugs worked out (which looks tentatively promising right now). I still have quite a bit of firmware coding to work on, then I’ll be ready for the next (and hopefully last) PCB spin. With any luck, that should come in about 8-10 weeks. In the meantime, I want to work on some side projects, and perhaps some opportunities to raise more capital to fund CC1 development. In that regard, I’ve been looking at a neat part recently. It’s a MEMS VCXO from SiTime called the SiT3808. What’s cool about this part is that it has linear voltage tuning, so that you don’t have the uneven tuning response like you would from a varactor-tuned VCXO. The phase noise on the spec sheet also looks very good. I ordered some samples for 7.030 MHz and 28.060 MHz and breadboarded them to test the frequency stability. It was nothing short of amazing. The 7.030 MHz part had a long term drift of 5 Hz in 1.5 hours. The 28.060 MHz part drifted only about 20 Hz in 2 hours. That’s pretty spectacular for CW use. Since the 28 MHz part was so stable, I created a QRP transmitter for it by adding on a keying circuit and a couple of BD139 amplifiers. It outputs a very clean and stable 2 watt signal and has a tuning range of about 20 kHz. 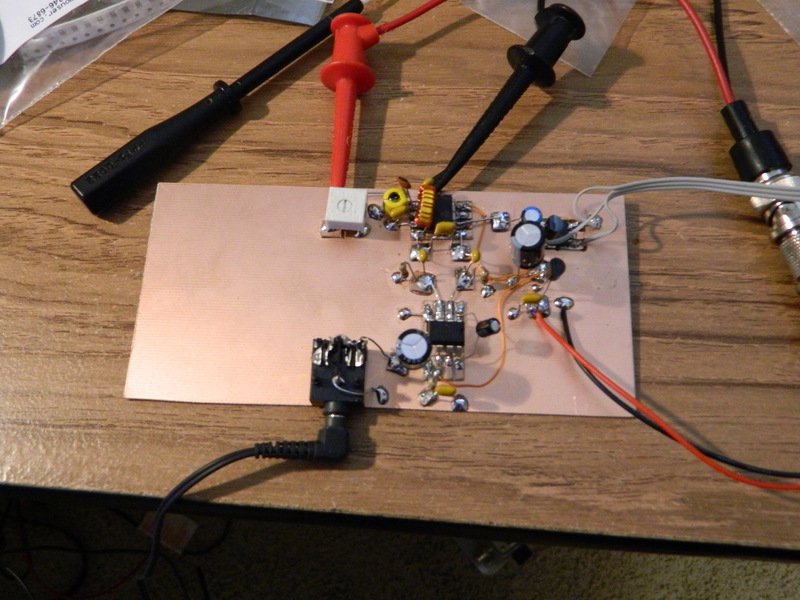 I also was fairly easily able to create a TX offset circuit, so that the transmitter can be paired with a direct conversion receiver (which I plan to do soon). Since tuning is linear, the offset is the same anywhere in the tuning range, unlike a typical varactor-tuned crystal oscillator. I’ve been thinking about a way to introduce these parts to the ham community, since I don’t believe that I’ve seen them mentioned by any homebrewers or used in any kits. Last week on the qrp-tech listserv, K7QO proposed a group build of the venerable NE602/LM386 direct conversion receiver (this one from chapter 1 in Experimental Methods in RF Design). Since this design is so well known, it seems like a “remix” of this design using the SiT3808 as the local oscillator might be a fun way to spread the word about the product. I breadboarded a version with the 7.030 MHz SiT3808 sample, which you can see below (the SiT3808 is in the upper-right corner, and it obscured by the tuning pot wiring). It works exactly as expected. Wide open band signals directly dumped down to baseband, and a nice, stable LO. This particular SiT3808 part number only tunes about 4 kHz, but I will be able to get parts with a greater tuning range. I’m consulting with SiTime right now about bulk pricing, and hopefully I’ll be able to do a kit run of at least 100 of these bad boys in the near future. Let me know in the comments if this is something that may interest you. So that’s my big rant for the day. Stay tuned for further updates on all of these projects in the near future. The question is – are you a crystal set, TRF, regen, direct conversion, or a superhet, and what kind of filtering do you have? OK, enough of this stream of consciousness talk. The MEMS VCO sounds interesting and stable. If I can just get myself torn away from my air-spaced variable capacitors, perhaps I’ll build one someday! Please blog again whenever you have news to share. I’m always keen to know what you’re up to. I am looking for a compact, lower power, tunable, but with fixed final frequency adjustment or channel selectable 900 MHZ receiver, can you assist me in locating such a piece of hardware? I would like to create a personal project that will monitor the Collett Communications snowmobile groomer warning beacon (GWB) that broadcast an Amplitude Modulated signal of the audible tone “Dee Daa” in the 910.509 – 910.603 MHZ range. This dedicated RF receiver module would be mounted on my snowmobile to alert me via an LED display when a groomer is working on the trails in the vicinity. Do I need to look specifically for an Amplitude Modulation receiver, or could another type of modulation receiver detect the signal (Analog Modulation, ASK, FSK, OOK, ……. ), not necessarily demodulate the signal, but to simply detect the presence of the raw signal to then output to a micro controller to illuminate a warning LED indicator? Thanks for stopping by the blog! After thinking about your question, I’m not sure if I can give you the correct answer, so I’m going to put it out to my wider network and see if one of them can assist you. The complicated way I can think to do this would be using a SDR receiver (I’m using the Nooelec NESDR Mini 2 RTL-SDR stick) running on a Raspberry Pi 2 using GNU Radio as your decoder. You’d be looking at about $100 in parts, plus a lamp of some kind connected to the GPIO pins on the Pi 2 as your indicator, and a case and power supply (12V to 5V micro USB adapter should do it if you can pull power from the snow machine). The complication of this is that compiling GNU Radio can take a very long time, and that programming in it might be slow going on the Pi 2. But if you can make it work it absolutely has enough smarts to do precisely what you want it to do, and if you get it working on a desktop or laptop machine you can transfer that code to the Pi.